Example: B4C fibres in AlSi, relief between fibres and base material, Mag. 200x. Material from different phases is removed at different rates, due to varying hardness or wear rate of the individual phases. Relif does normally first occur during polishing. The most important parameters to avoid relief are preparation time and polishing cloth. The preparation time should be kept as short as possible. When developing a new method the samples have to be checked in short intervals, 1-2 min. The polishing cloths have a strong influence on the planeness of the sample. 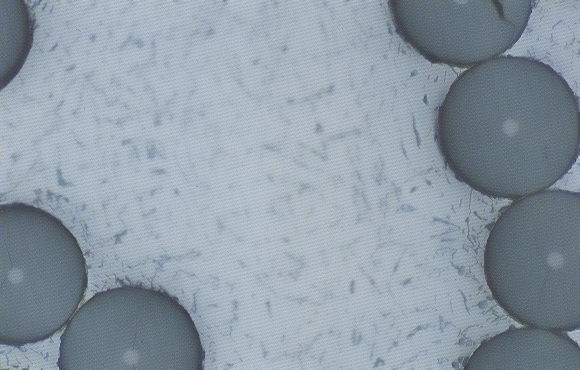 Polishing cloth with low resilience produces samples with les relief than cloth with high resilience. Reference: Metalog Guide, page 74-75, Struers A/S, 2610 Rodovre, Dennmark. Note: Image and text by courtesy of Struers A/S company.